Russian painter, creator of abstraction in painting, which was born in Moscow on December 4, 1866. In 1871 his family moved to Odessa. From 1886 to 1889 he/she studied law in Moscow. In 1896 he/she rejects a since teaching in the University of Dopart to study art in Munich. In 1901 he/she founded the Phalanx group, whose main purpose is to introduce the French avant-garde in the provincial environment Munich, which opens a school that teaches. His paintings of the early years of the century are landscapes executed with spatula, in a somber beginning, to then acquire an almost fauve intensity; He/She also painted fantastic themes based on Russian traditions or the German middle ages; This period is marked by technical experimentation, particularly in the use of the temple on a dark paper, to give an impression of transparent surface, illuminated from behind. The tonal consistency of chiaroscuro emphasizes the scheme by erasing the distinction between figure and background, resulting in an almost abstract composition. In 1902 he/she exhibited for the first time with the Berlin Secession, and performed his first woodcuts. In 1903 and 1904 he/she travelled by Italy, the Netherlands, Africa and visit Russia. In 1904 he/she exhibited in the Salon d'Automne of Paris. In 1909 he/she was elected President of the Neue Kunstlervereinigung München (NKVM). The first group exhibition, takes place in Munich's Thannhauser gallery that same year. Towards the end of the Decade, Kandinsky paintings denote a strong tendency to flatness the equivalent in intensity of areas of color and shiny surface that destroys any illusion of depth. Pictures of riders in combat series begin in 1909, and in them, the horizon is eradicating gradually, as well as other spatial references. In 1910 he/she made his first abstract watercolor, in which "(...)spots more dark dominate two colors, red and blue, which are obviously related, because they are always together. Red is a warm color and tends to expand. Blue is cold and tends to shrink. Kandinsky does not apply the law of simultaneous contrast but the check; It serves two colors and two manageable forces that can add or subtract, depending on the case, i.e. According to the impulses that feels, relies on both so they limit or promote each other. There are also signs of linear, threadlike; they are, in a sense, indications of possible movements, are strokes that suggest the direction and pace of stains that roam the role. They put in motion all the watercolor (...) (Argan). Composition IV of 1911, the figures are so simplified, color is so arbitrary and space so confusing that it is impossible to distinguish the subject without reference previous pictures of the series. Especially disorienting for the Viewer is the way in which the line, both as an independent element, or as limit is used to color. 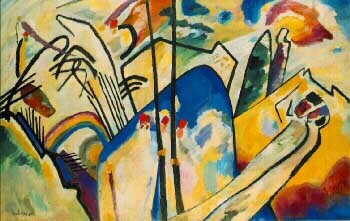 In 1911, Kandinsky and Marc are removed from the NKVM and the foundations of the Blaue Reiter, editing an almanac in 1912. The first exhibition takes place in December, at the Munich's Thannhauser Gallery. In 1911, Kandinsky publishes of the spiritual in art; works by Kandinsky and Marc Almanac was published in 1912, and Hans Goltz takes place the second exhibition of the Blaue Reiter in the gallery. This year the first solo exhibition of Kandinsky takes place in the Gallery Der Sturm in Berlin. 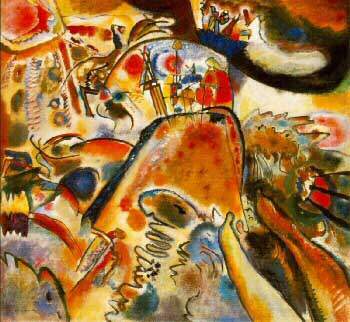 The favorite themes of Kandinsky at this time are violent and apocalyptic, and have their origin in the popular religious images of Germany and Russia. Towards 1912 his work has passed by various productive developments. In 1913, when he/she painted black lines, already you can not speak of abstraction based on a theme; the color and the line taken by themselves such expressiveness that do not already follow a preset model. Works like this are the first truly abstract. The development of Kandinsky towards abstraction finds its theoretical justification in abstraction and empathy of Wilhem Worringer, which had been published in 1908. Worringer argues that the hierarchy of values to use, based on the laws of the Renaissance, is not valid to consider the art of other cultures; many artists create from reality but with an abstract impulse, which makes the latest art trends are given in less materialistic societies. Kandinsky was also interested in Theosophy, understood as the fundamental truth that lies behind doctrines and rituals in all religions of the world; the belief in an essential reality behind appearances, provides an obvious rationality to abstract art. On of the spiritual in art, speaks of a new epoch of great spirituality and the contribution painting it. New art should be based on a language of color and Kandinsky gives guidelines on the emotional properties of every tone and every color, as opposed to theories about color older, he/she is not interested by the spectrum, but only in the response of the soul. Pleasures (oil on canvas, 1913). In 1913 his works presented in the Armory Show in New York and at the outbreak of the first world war, returns to Russia, settling in Moscow, until 1921. As of the October revolution, Kandinsky developed administrative work for the people's Commissariat for education; among the projects of this organism are the Foundation of several museums and the reform of the educational system in art schools. Kandinsky ideas to training artists, based on theoretical analysis of color and form, are the opposition of the constructivists, more concerned about production issues. This convinces Kandinsky that post-revolutionary Russia is not a good environment to develop pure painting and returned to Germany, beginning his activity as Professor in the Bauhaus of Weimar in 1922. Initially there are no painting classes at the Bauhaus; Kandinsky taught a basic course, where he/she explains the properties of forms. His work during the years of the Bauhaus is much more disciplined than in the pre-war period. Although it is heavily influenced by the Russian avant-garde (Malevich and Lissistzky), in floating geometric painting in the early twenties, Kandinsky develops its own internal logic; He/She builds his compositions from the tensions that creates each shape. This is exactly the concept that is coded in his book point and line on the plane, published in 1926. View the theoretical bases of the painting so strong and decisive as those that exist for the music. In 1923 held his first solo exhibition in New York in the Société Anonyme, which ends up being Vice President. With Klee, Feininger, and Jawlensky, it forms the Blaue Vier group, organized in 1924 by Galka Scheyer, who is their agent in the United States. In 1925 the Bauhaus moved to Dessau, and in 1928 Kandinsky obtained German nationality. His work from this period, like arrowheads in the arc (1927), geometric forms, the image becomes increasingly complex and motor rhythms are increasingly more controlled; It is a work full of apparent cosmological symbolism, but it is an experience carried out by non-speculative and operative procedures. For Kandinsky, at this time, art does not condemn, nor does it exclude the behavior of man integrated in the industrial system, but that it rescues its instrumentality limit. The work has an emotional force, through truly analogous to the music of unambiguous meanings. Several circles (oil on canvas, 1926). Solomon R. Guggenheim (New York, United States) Museum. In 1933 the nazi Government definitely closed the Bauhaus; Kandinsky then settled in Neuilly-sur-Seine, on the outskirts of Paris, and obtained French nationality in 1939. In Paris it is influenced by the biomorphism of Arp and Miro; pictures of his last time evoke in the spectator beings, although impossible to identify. This is not a turning back as still being interested in extracting the essentials of the form, as an attitude opposed to make abstraction from the appearance. In 1937, the nazis kidnap fifty-seven works by Kandinsky, as a result of the cleansing campaigns known as degenerate art. He/She died on December 13, 1944 in Neully. 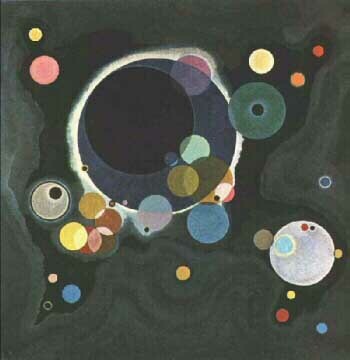 http://www.lsi.usp.br/~artigas/kandinsky/kandinsky.html: 66 works of the artist. A Biographical Dictionary of Artists, London Sir Lawrence Gowing Editor, 1994.